We all love a good ribeye because of its naturally juicy, flavourful beefiness. Ribeye is greatly marbled with a large portion of fat, making its rich flavour flow an absolute delight for your taste buds. Because of its natural flavour, there isn’t much need for marination – just add a little salt and pepper to taste and the meat will do the rest. Ribeye comes from, surprise surprise, the rib of the cow. It is taken from ribs six to twelve, between the loin and the shoulder. It comes in two ways – either boneless or bone-in. For bone-in ribeye, it should have only one bone, otherwise, it becomes a rib roast. You can cook ribeye at any heat you like for your desired result, but we recommend that you cook it slowly for a long time on about 60 degrees Celsius to really bring those juices out. This will give you a steak just shy of medium and absolutely delicious. If you choose to cut corners on your cooking time, you will end up chewing a rubbery, unrendered fat of meat. That just sounds awful, so try to avoid that! 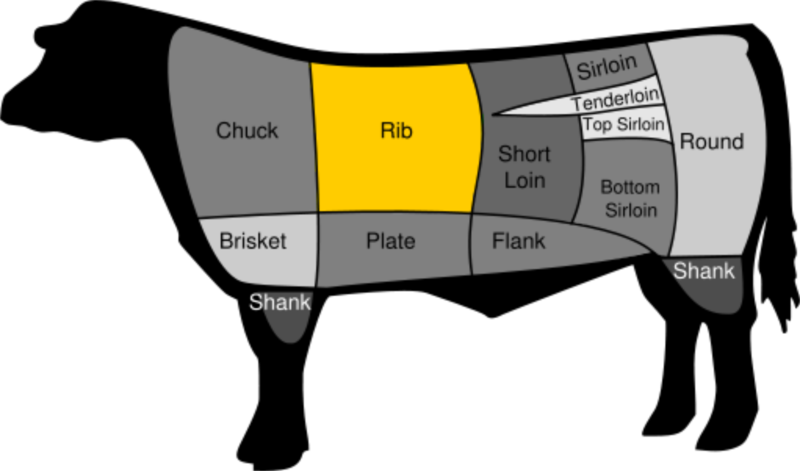 Let us know how you like to cook your ribeye – we would love to hear different techniques!